It’s the one purchase that you never wanted to make. But although your plans have changed, he or she still lives on as your child forever. 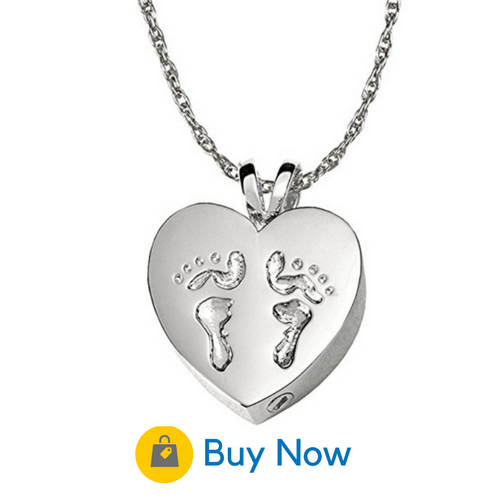 A beautiful baby urn or some lovely jewelry can be a healing way to keep their memory in your heart. 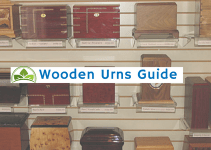 Below we’ve listed some of best urns and jewelry to choose from. A teddy bear, that comforting and universal symbol of childhood. It’s beautifully hand-etched in pink and white onto the urn by Indian artisans. The nickel-plated blue finish gives it a look which is metallic yet delicate at the same time. 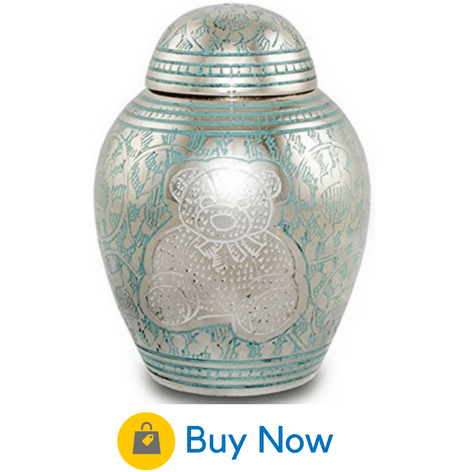 A threaded lid allows easy access as well as a secure closure for your baby’s ashes. 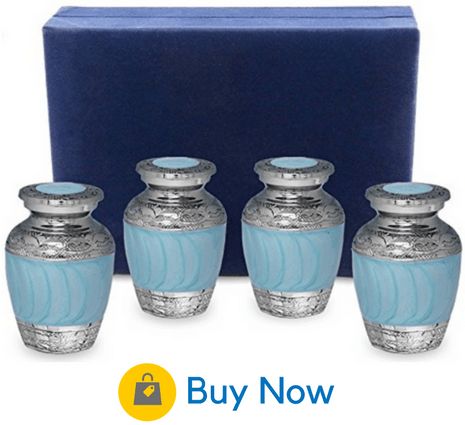 The urn is attractive enough to display anywhere in your home. For more information about the urn and to purchase, visit the OneWorld Memorials store. What’s nice about this urn is that it doesn’t really look like an urn at all, just a nice framed photo. But you will know that your baby’s ashes are resting safely inside, close to you always. A sliding panel easily opens to hold the ashes, and a twist-tie bag makes it a safe place for storage . 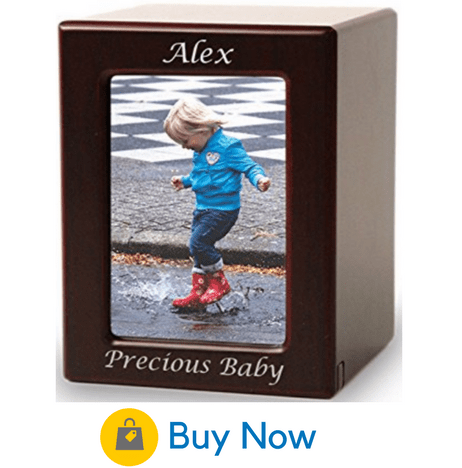 Made of tough fibreboard, this photo urn is certain to stand up to the test of time. You can find out more at their Amazon store. This set of four tiny brass urns are perfect if you want friends or family members to have a keepsake of your little one. 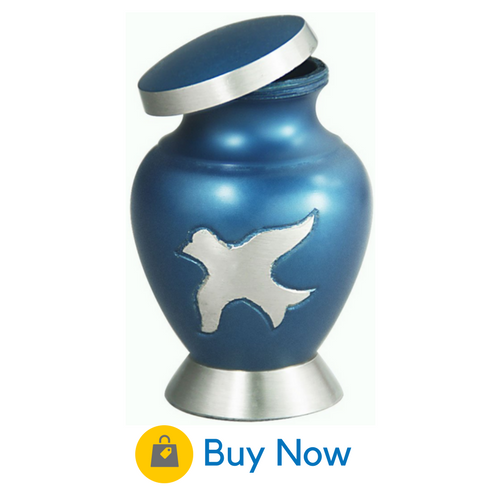 Made of baby blue enameled brass, each urn can fit in the palm of your hand and fits just a tiny amount of ashes. Other small mementos such as a lock of hair could be placed inside instead. Each urn comes with its own small velvet bag for safekeeping. Check out this Amazon store for more information. These urns are just right for celebrating the unique boyish personality and promise of your little one. Meilinxu Baby Urn: This mini-urn is finely crafted in solid blue bronze with a beautiful hand-carved design of white birds. The threaded top screws on so that you can feel secure that your baby’s ashes will rest safely. 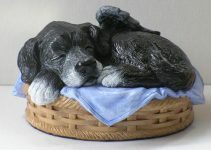 Felt along the bottom protects your furniture, so that you can display the urn in your home without damage. A black velvet box is included for display or storage. More details are available at Meilinxu’s online store. 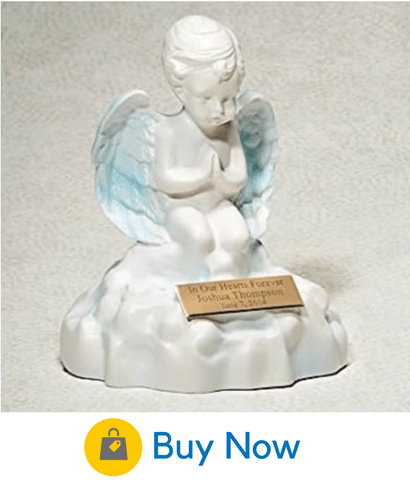 Angel Cremation Urn: This beautiful statue made of simulated marble displays an angel on a cloud. It’s a traditional and comforting image for anyone mourning the loss of a child. A faint blue tinge to the wings gives the angel a boyish look. The urn comes with a 3×1” metal plate which can be engraved with your baby’s name, dates, along with a meaningful quote or saying. Details can be found Infinity’s Amazon store. 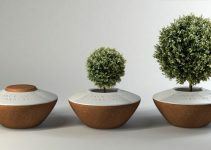 This urn is as simple and sweet as childhood itself. It’s a basic blue cube picturing a teddy bear at the top. It’s made of wood, just like the old-fashioned building blocks your baby boy might have enjoyed playing with. 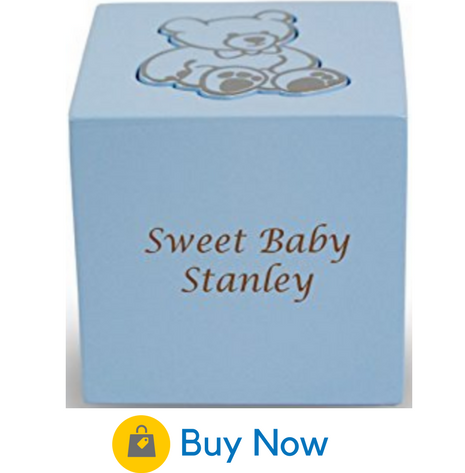 You also have the option of getting your baby’s name engraved on the box. Placed in your living room, it can add that element of simple, childish fun that your little boy would bring if he were here. 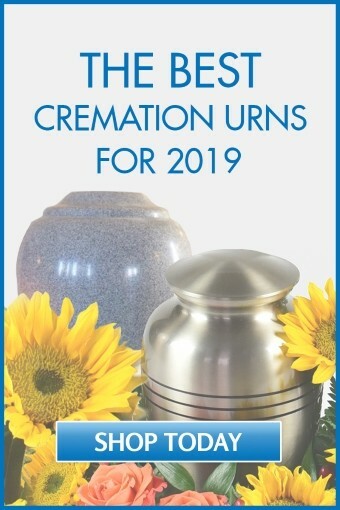 Check out the urn at their Amazon store. Honor all that was sweet and feminine about your baby girl with these urns. 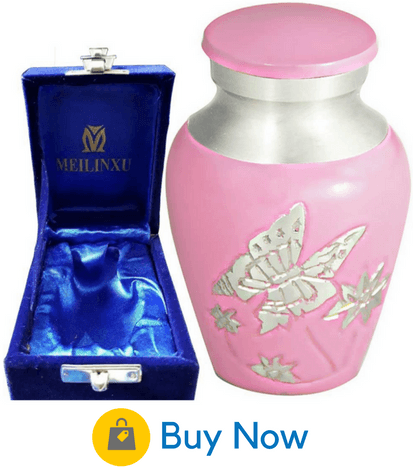 Pink Butterfly Baby Urn: This urn is crafted in brass, and sturdy yet delicate at the same time. A design of hand-engraved butterflies will comfort you as you imagine the spirit of your baby girl flying free in nature. It comes with a velvet box, convenient for packing or storage. 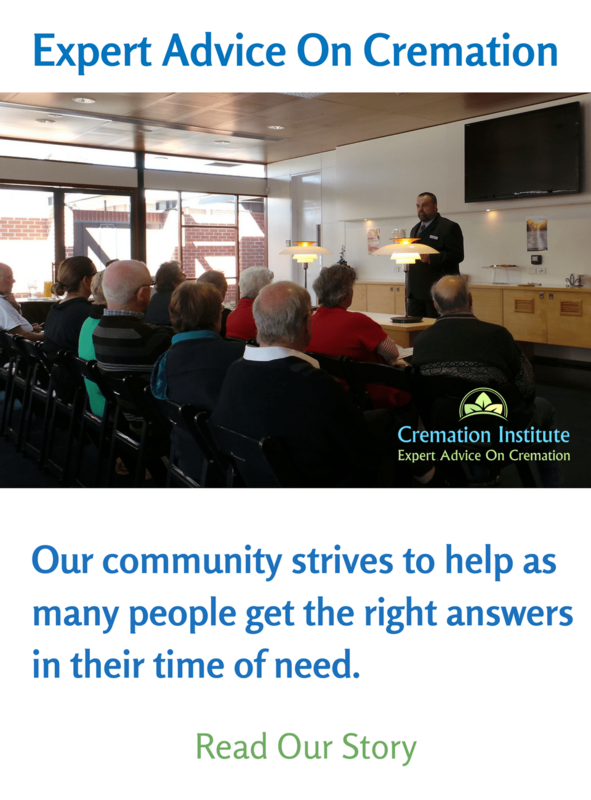 Only 2.55 inches tall, this tiny urn is sometimes bought in multiple units so that ashes can be shared among loved ones. Check out their product store for more details. This is a delicate, heart-shaped urn in a tender shade of baby pink. At only 3 x 1.5”, it can easily be kept next to your bed or in your purse for a constant, tangible reminder of the life of your little girl. It comes with a velvet box at no extra charge. Four gold footprints represent the tiny footprints she left on your heart. It’s crafted in brass, and is certain to look beautiful forever. You can find more details at their store. 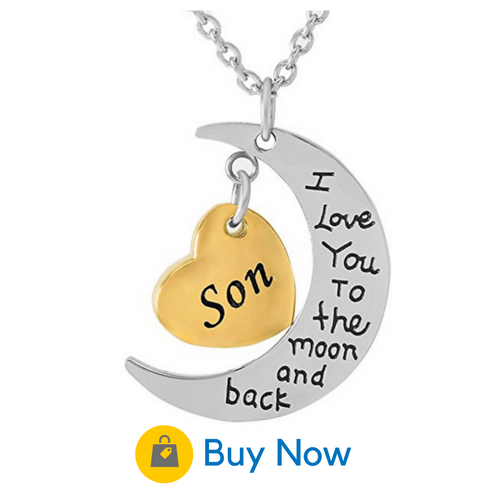 Jewelry is a wonderful way to memorialize your baby by wearing him or her close to you wherever you go. Here are some options that are fitting to honor your baby’s memory. 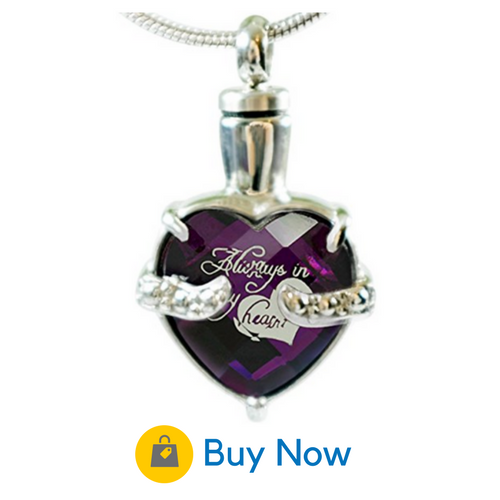 This is a durable but elegant pendant that allows you to wear your baby’s ashes near your heart every day. The vivid purple shade of the stone honors the vibrance of the love for your child. The words “Always in my heart” are etched inside the stone. It comes with a velvet bag, a strong but beautiful chain, and an easy-to-use fill kit. The pendant and chain are both hypoallergenic and will not irritate your skin. You can find more details at the Infinity Keepsakes online store. Made of the finest sterling silver, this is the pendant to go with if you want a small remembrance of the very highest quality. The precision closure is tiny, discreet, and secure. A sterling silver chain and a filling kit are included. 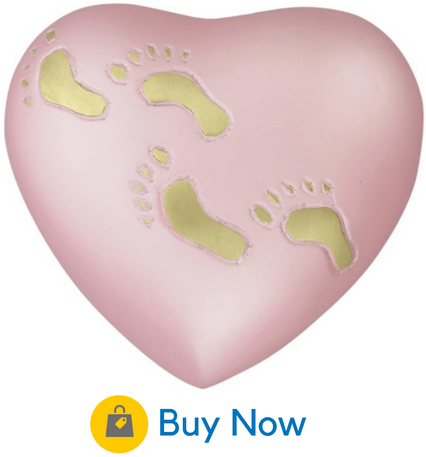 A sweet imprint of baby feet are a beautiful tribute to the short life of your baby. Visit their online store for more information. This stainless steel pendant is sweet and beautiful piece of memorial jewelry. It’s shaped like a crescent moon that encloses a heart. The ashes can be secured inside with a screw and a rubber gasket. It comes with a gift box and card, so it can easily be given to a friend or loved one who has lost a child. The best place to purchase this necklace is on their Amazon store.